Create a foot switch to control page navigate on the app Onsong on my iPad. 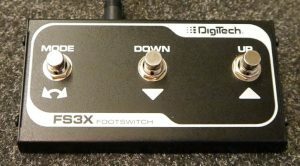 My plan is to use my DigiTech FS3X 3-Button Footswitch and add a bluetooth module. The module is a Adafruit Feather 32u4 Bluefruit purchased from Electrokit. The module has a JST-connection for a battery and a built-in charger circuit. It will act like a Bluetooth keyboard and send keystrokes when button is pressed. Adafruit have a good tutorial here! I’m starting with their code and see if i manage to make it work. Got my board and soldered the three buttons to it. Mounted the board wirh double sided scotch and glued the usb cable temporary on the inside. My plan is to use the battery when i find a cool on-off switch. The installing of the arduino sketch was pretty easy. Just followed the Adafruit instructions. The button is configured to be ”left arrow key”, ”right arrow key” and plain T-keystroke for later usage. Don’t know what to use it for yet. I tried it and after a reeboot it worked perfect.